When I was in Joe Fresh sometime last year I was surprised at the large selection of nail polish they had displayed. At the time these were 3 for $10 so how could I not get some! I was looking at them the other day and realized that aside from Cinnamon (which was one of the colours I used for my Weirwood Tree Mani) I haven't tried these out. So let's do that now! 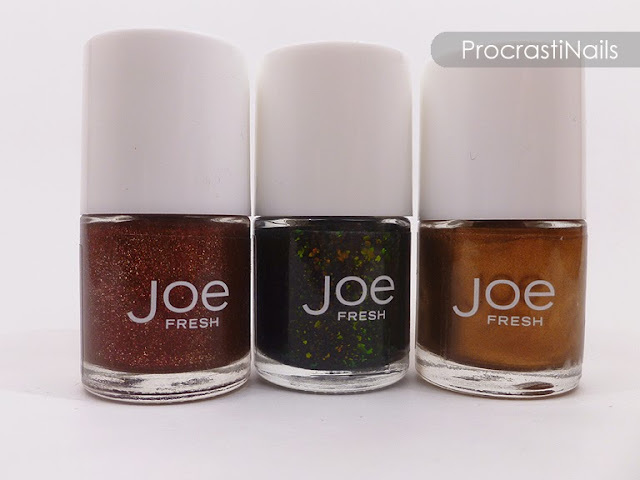 I think the packaging for these polishes is super cute. The bottles are small (6 mL) but still hold a decent amount of polish. I chose three colours that jumped out at me and that weren't like anything else I already owned (as I tend to do when trying new brands), and now that I've tried them I can say I am 100% happy with all my choices. 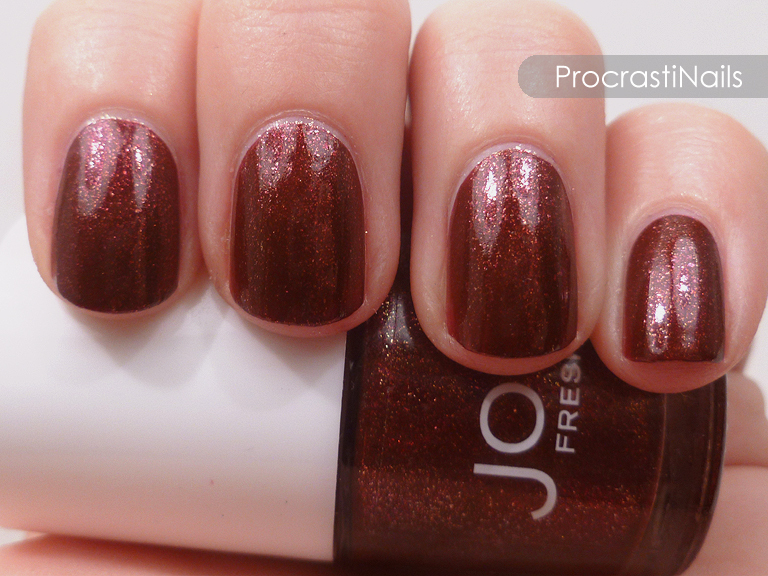 :) On to the swatches! 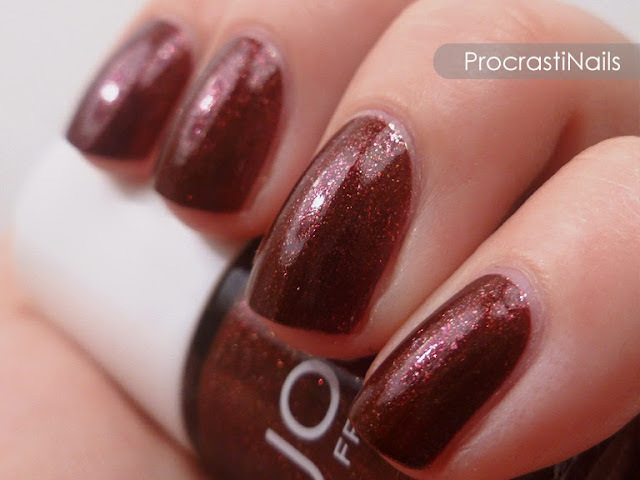 I think that Cinnamon is the perfect name for this colour... 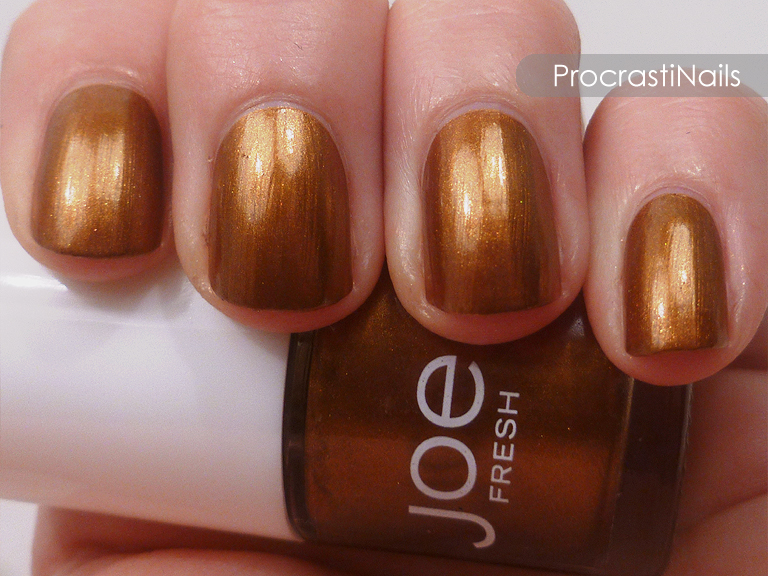 This shade is sweet and warm and comforting, with just a hint of impact from the sparkle. 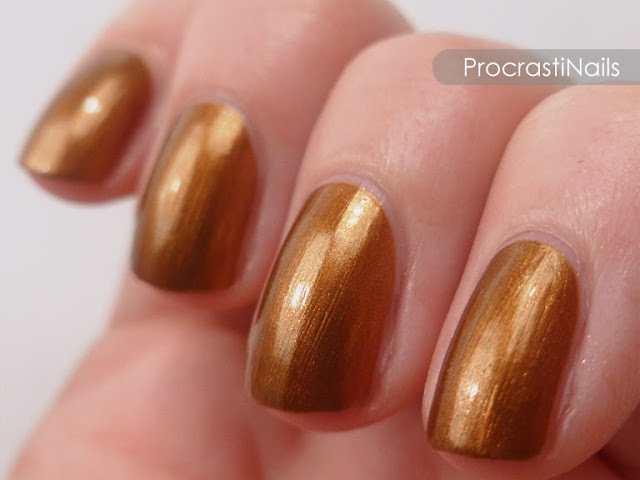 Pictured above is three shades of Cinnamon with no top coat. So the reason I was so attracted to this is because it looks similar to my favourite combination of black polish with Essie Shine of the Times on top. 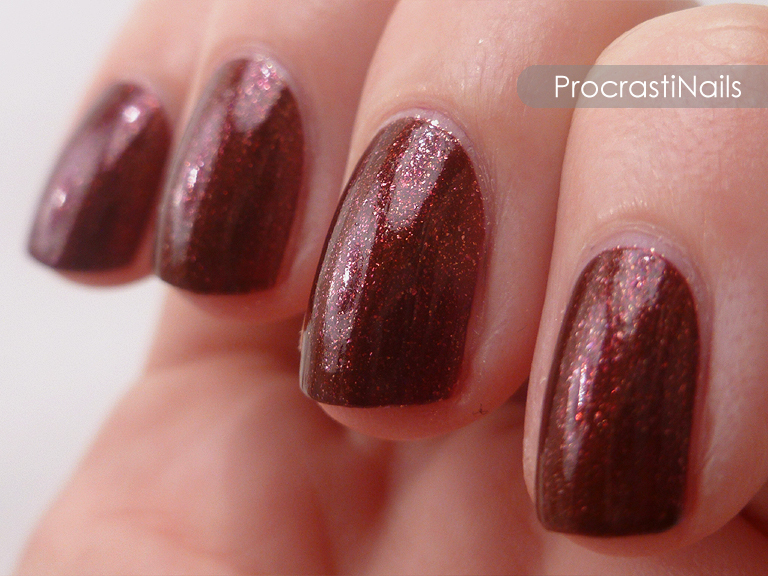 As you may know, Shine of the Times is a gorgeous multichromatic flakie topcoat that has been discontinued (*tear*). It is my actualfax favourite topper so I've been careful not to use it too often so it will last me years to come. Now I no longer have to waste it when I want to put it over black, because Twilight does that colour combo for me but with bigger flakies! Yay! The bottle here best shows the full spectrum of colours that come through in the flakies - beautiful! 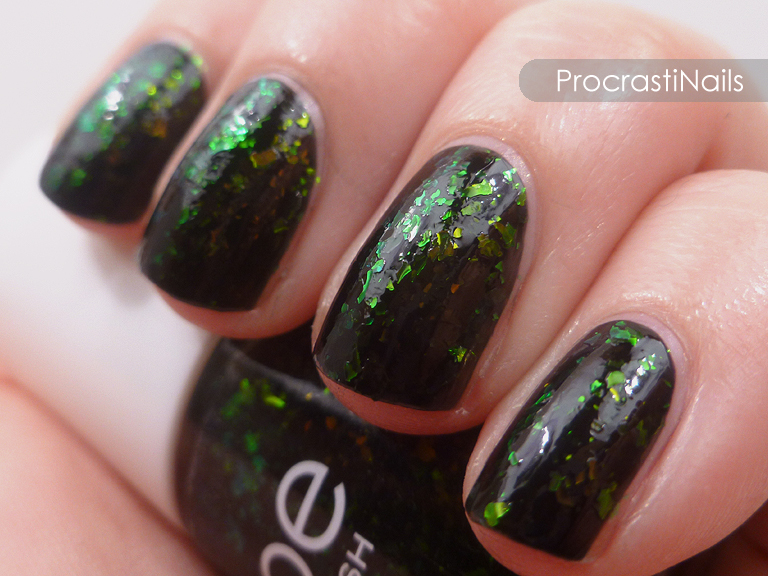 Twilight is a gorgeous black base with multichromatic flakies floating in it. The flakies shift from blue to green to yellow to orange depending on the angle, and they're mixed in quite generously throughout the polish. 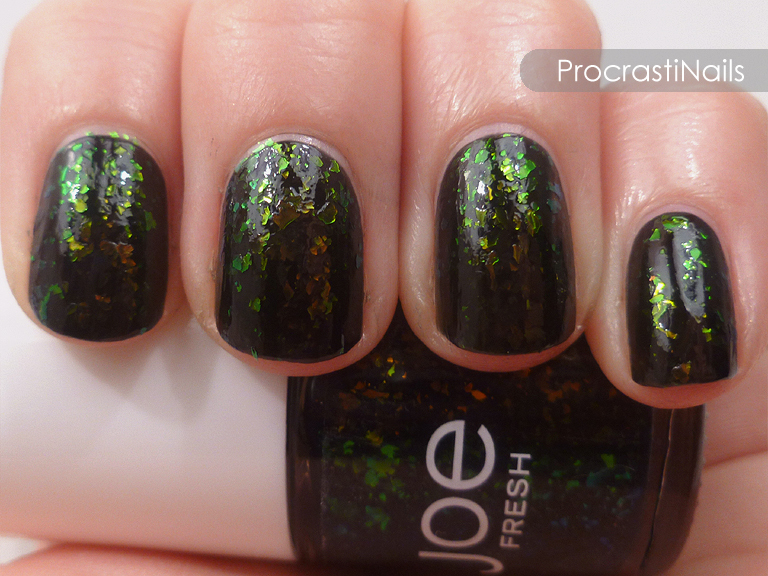 Pictured here is three coats, which were needed to reach full opacity since the black is pretty sheer. If you were short on time you could also put it on over a coat or two of solid black, and you'd be good to go! 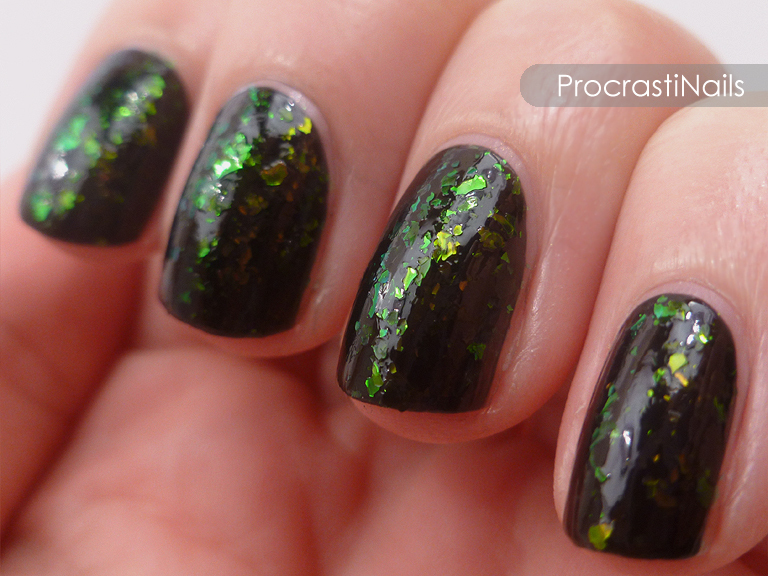 I didn't put a top coat on so you can see that the flakies do stick up a bit, though not enough to really feel them. 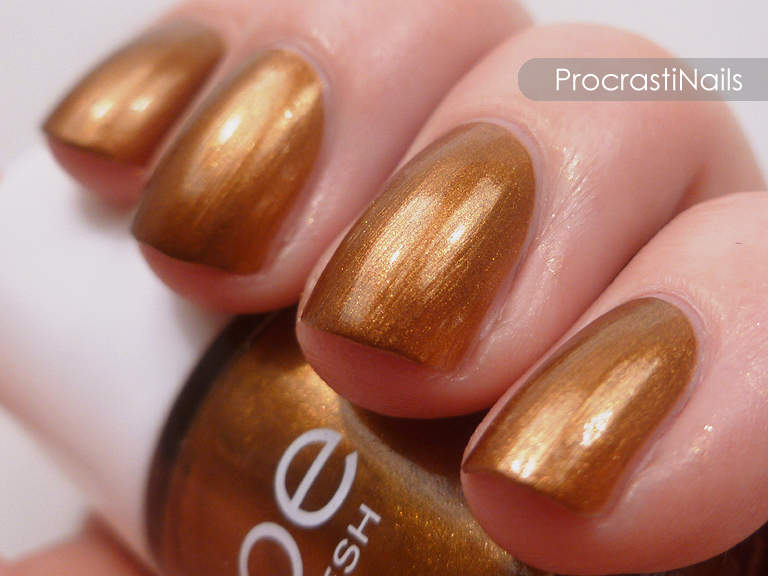 Bronze is a warm golden metallic polish with a bit of shimmer in it. This colour doesn't knock my socks off, but I feel like this is a colour I could use for a Christmas mani, or maybe for some type of steampunk design. It's industrial but with a hint of life to it. Hmm! As you can see it does leave some evidence of brush strokes, but most metallics do so it doesn't bother me much. Pictured here is three coats without top coat. Yeah, I was super pleased with how Twilight looked when I tried it. With top coat I think it'd be perfect, just to smooth it out a bit. :) I think Joe Fresh has been talking about expanding into the UK market, so keep your eyes peeled!